This little delight, far better known in Latin America (where it is a literally essential ingredient of what Gringos call “salsa”), is the subject of much gross misunderstanding in North America. 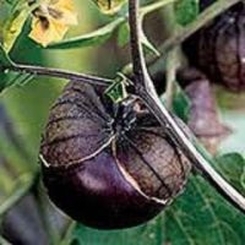 It is continually being confounded with its close and not-so-close relatives (described below); we once, back in California, ordered some “tomatillo” seeds which, when we finally harvested the crop, we discovered to have been Cape gooseberry—possibly useful in desserts, but comically useless for salsa. If you grow this crop—and we think everyone should—be sure you’re getting Physalis ixocarpa and nothing else. (It should be noted that some gardeners disagree with that, but, like Will Rogers, we only know what we read in the newspapers—though the season we grew only one plant, it in fact flowered but never gave fruit. When there’s a doubt, why not do it the safe way, and have at least two? There’s zero downsdie save a little extra space, and if you’re growing this plant at all, you probably want more fruit than one plant would yield anyway. Although growers have made sporadic attempts to improve the tomatillo by selection, little has been accomplished, and the tomatillo remains a crop with great variability in plant habit, fruit size, earliness, and other characteristics. There are only a couple of formally recognized cultivars, and most of those U.S. seedsmen who do offer tomatillos at all still usually offer a generic “tomatillo”. But there are “strains” that are pretty well recognized—perhaps true cultivars that have recently been identified or selected out: one specialist house, for example, offers five named tomatillo types. Toma Verde. Some seed houses even equate that name with tomatillo; a standard, productive type. Verde Puebla. It’s large-fruited (which is good), and in at least one test was more productive than Toma Verde. Purple Di Milpa. “Di milpa” just means “from the fields”, as this type commonly grows wild as a “weed” in the cornfields of Latin America. De Milpa is an heirloom variety from Mexico; in one extended test, it had the smallest fruit and lowest yields but its fruit did not crack and had the best storage quality, remaining green and firm for up to two weeks even at room temperature. It is commonly described in such terms as “has a sweet and sharp flavor and is considered by many to be the best-flavored tomatillo” and “has a sharper flavor than most other varieties, wonderful when combined with the milder green type in salsa”. There are lots more types available than just those. The list is representative, not by any means exhaustive! Note that “days to maturity” given by seedsmen are all over the lot on these. For the same type, one can find, for example, quotations ranging from 70 days to 120 days. A test done by Purdue University showed all types they tested coming in at 55 to 60 days “to flower”, which we take to mean harvestability, so we would use 60 days as a figure for all types (it’s not likely to be critical). Just of those types tested by Purdue, the most productive type was the Verde Puebla, with Toma Verde second and Di Milpa third (of those three). They made no notes on eating quality. It is, however, widely said that purple types have a better taste, with words like complex and tangy frequently mentioned; they are also thought to hold somewhat better once picked. This looks like a vegetable where, for flavor, there is no obvious winner, save perhaps that a purple type might be the best choice; beyond that dubious generality, it seems to be a matter of personal preferences, and plant productivity. Well, also some have a preference for larger-fruited types, while others prefer smaller-fruited types. Just more personal preferences. Since one must grow at least two plants to get fruit at all, it would be nice to know whether the two need to be of the exact same type. If not, that immediately doubles the number of types one could sample in a given season. Regrettably, despite much searching we could not find definitive information on that point. We did find a page from Seed Savers Exchange on the need for a second plant for pollination, and it emphasizes the need for isolation of tomatillos to avoid type crosssing; that strongly implies that different types can and do pollinate one another, so it seems that yes, Virginia, you can plant two different types. But, obviously, you cannot save seed from crossed types (unless you are a real adventurer). We would go with a Purple Blush and a Verde Puebla. YMMV. Tomatillos are pretty hardy, so we don’t have to be too fussy about earliness or lateness. The days to maturity figure we use is 70 days, a conservative figure considering that Purdue found 55 to 60 days the norm. Our mid-season is around July 22nd (in reckoning, use whatever yours actually is), from which 35 days back is June 17th; that means, then, harvest around August 26th. On June 17th, the daily temperature range is high of 76° and low of 42°; on August 26th, it’s 81° and 44°, suggesting that we will be able to keep harvesting for a long time. Tomatillo seedlings need quite some time, 6 to 7 weeks, to be ready for transplanting; that means starting them around May 6th or, to be conservative, April 29th. Sow seed indoors, in good-sized peat or cow pots, say 4 inches. Keep the pots as warm as you can (preferably with heating pads) till emergence, their ideal germinating temperature being in the middle to upper 80s. Allow about 7 weeks for indoor growth time. Prepare their bed by deep digging, addition of organic material, and—as tests may show necessary—amendment with organic fertilizers. Tomatillos do best in a rich, loamy soil, though they’re pretty tolerant (growing virtually as weeds in their native climate). A standard garden-soil pH of 6.5 to 6.8 works fine, but they can do well enough in anything from 6.0 to 7.0. Basically, their needs are like those of tomatoes. It is wise to use plastic mulch, preferably red, and to set that mulch out a couple of weeks before transplant time to get the soil warmed. Plastic mulch also suggests drip irrigation, which is always a good thing; and row cover is advantageous as well in our climate. Possibly because of the notorious variability of tomatillo plants, there seems wide disagreement about a good inter-plant spacing for them: the range offered runs from 15 to 24 to even 36 inches. On the one hand, one wants them as close as practicable, to conserve garden space and to encourage the necessary cross-pollination; on the other hand, one doesn’t want the plants competing for sun and space. We used 24 inches and were glad we did—they bushed out quite a bit. All advice says to be careful to harden the plants off for a few days before actual transplant (we include the hardening-off days in the 7 weeks of seedling growth). Whatever you do, though they’re fairly hardy, do not expose them to risk of actual frost! Plastic mulch (applied a couple of weeks before your expected transplant date), row cover, and drip irrigation—the usual warm-weather-crop adjuncts—are all advisable. So too are cages (real tomato cages—see the article here on tomatoes—not those wimpy little conical frames they sell in stores). The tomatillo is a low-growing, sprawling bush plant, usually not more than 2 feet high. That can make two things awkward: watering and weeding. For watering, drip irrigation is an easy and inexpensive answer. As to weeding, use of plastic mulch renders the question moot. Water well, as for tomatoes. If you used row cover, get it off as soon as temperatures allow, so the plants can be pollinated by bees; if you don’t seem to have bees in your garden, take care to hand-pollinate your tomatillos. Do recall that the plants don’t like actual freezes, but are otherwise pretty temperature-hardy. If, as it grows, a plant is spreading too much (which caging minimizes), you can pinch off the more aggressive branch’s tips. If you want to pick earlier than at full maturity, select fruits about 1¼ inches in diameter; by harvesting before full maturity, you can spread the harvest period out over perhaps two months. Commercial growers try to harvest when the fruits are well-formed and have substantially filled the husk, but are still bright in color (overmature fruit are light in color or yellowish, and it is said that those should be avoided as being sweeter and thus undesirable for most standard tomatillo uses). The purple varieties are said to grow significantly smaller fruits, but they grow more and so produce about the same net weight per plant—but use your head with respect to picking sizes, depending on the type you’re growing. Tomatillos are members of the prodigiously useful Solanaceae (or nightshade) family, as are tomatoes, peppers, tomatillos, and eggplants, among others. Some botanists unite this species with P. philadelphica, saying that it arose from P. philadelphica through cultivation (probably true, but possibly irrelevant). The tomatillo is native to Central America, and was used by the Aztecs in pre-Columbian times. In fact, there is archaeological evidence of its use as a food in the valley of Tehuacán in the centuries from 900 B.C. to A.D. 1540. Before the European arrival, the tomatillo was used far more than the tomato, but eventually the latter came to dominate, except in some rural areas where the tomatillo is still preferred over the tomato. The ancestral wild tomatillo was domesticated in Mexico, then carried back by the Europeans on their arrival in the New World. It enjoyed some popularity till being eclipsed by the tomato. How long has the tomatillo been around? At least 52 million years. It was last modified on Sunday, 3 February 2019, at 18:30 EST.